Author/Opus: This is the 3rd puzzle from guest contributor Takeya Saikachi. Rules: Draw a route that starts at the gray Start circle (S) and passes through adjacent cells without crossing itself or revisiting any cells. Some cells may not be part of the route. White circles with letters represent packages that are to be picked up and delivered to the black circles marked with the same letter. 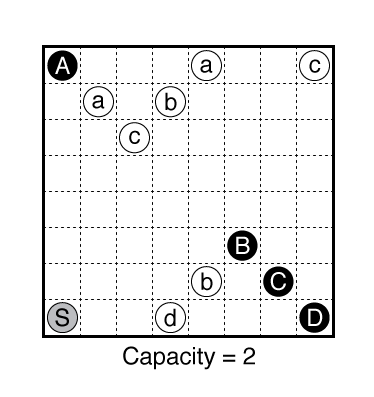 The carrier has a maximum capacity of packages that can be handled at once, shown below the grid. The carrier must pick up and deliver all packages on the route, returning to S with no packages in hand. Answer String: Enter the number of turns in each row, starting at the top and proceeding to the bottom. This example has the answer “224244”. 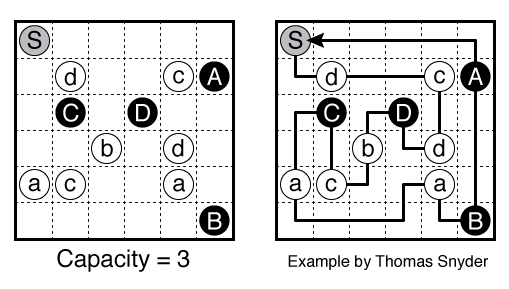 Note: Follow this link for other Loop/Path puzzles.